International Space Station (ISS) Program managers at space agencies around the world are currently in the process of ironing out an extremely complex and busy integrated schedule of comings and goings at the station, in light of recent delays to Soyuz launches and the inaugural station visit by SpaceX’s Dragon capsule. Following what was an extremely challenging 2011 due to numerous hardware failures – including the Progress M-12M and Fobos-Grunt spacecrafts – the Russian space agency Roscosmos continues to have bad luck in its quest to get its programs back on track. Last week, reports emerged in the Russian media that the Soyuz TMA-04M/30S spacecraft, set to launch the next trio of Russian and American crewmembers to the ISS, had suffered a failure during routine testing. It is understood at this time that the Descent Module (SA) of Soyuz TMA-04M was over-pressurised during leak checking, which, coupled with poor quality materials, caused welds to break in the hydrogen peroxide thruster propellant system. Specific causes of the over-pressurisation are unknown at this time, and a Russian commission is currently investigating the matter. Due to the nature of the failure, pressure integrity of the Soyuz TMA-04M spacecraft is believed to have been compromised beyond repair, which means that the SA is question can no longer be used and must be scrapped. Roscosmos have decided not to swap out the damaged SA with the SA intended for Soyuz TMA-05M/31S, as has been done in the past, and have instead opted to replace the entire Soyuz TMA-04M spacecraft – including SA, Orbital Module (BO), and Instrumentation and Propulsion Module (PAO) – with the Soyuz TMA-05M spacecraft, as swapping the entire spacecraft is quicker than de-integrating and re-integrating the SA from one Soyuz to the other. Due to this swap-out of vehicles, the Soyuz TMA-04M launch must now be pushed back, since there is insufficient time to ready hardware originally intended for Soyuz TMA-05M for launch on Soyuz TMA-04M’s date. Also, since the Soyuz spacecraft originally intended for the Soyuz TMA-05M mission will now be used for Soyuz TMA-04M, the spacecraft for Soyuz TMA-05M must come from Soyuz TMA-06M, thus creating ripple-like delays for future Soyuz flights. As detailed by NASA’s ISS Program Manager Mike “Suff” Suffredini at an ISS status press briefing late last week, following consultations between all the ISS international partners, it has been decided to push the Soyuz TMA-04M launch back from 30th March to 15th May, a delay of around 45 days for Russian cosmonauts Gennady Padalka & Sergey Revin, and NASA astronaut Joe Acaba. In order to avoid a large gap of three-crew station operations between the return of the Soyuz TMA-22/28S spacecraft and the launch of Soyuz TMA-04M, the Soyuz TMA-22 return will also be delayed by around 45 days, from 16th March to 30th April. The 45 day mission extension is not an issue however, since Soyuz TMA-22 arrived at the ISS back in mid-November 2011 around 45 days later than originally planned, due to the launch failure of the Progress M-12M/44P spacecraft in August. Thus, the delay in the Soyuz TMA-22 return only restores the mission to a normal duration, and thus doesn’t present any issues with leaving the Soyuz on-orbit past its 200 day orbital lifetime. As for other Russian launches affected by the “ripple” of delays, The Soyuz TMA-05M/31S spacecraft will be delayed for 45 days, from 30th May to 15th July. Soyuz TMA-06M/32S will slip by roughly 20 days, from 26th September to 15th October, with Soyuz TMA-07M/33S slipping by roughly 10 days, from 26th November to 5th December. As one Soyuz must depart the station before another can launch, the undocking and landing of Soyuz spacecraft prior to the launches noted above will slip by a similar amount to the delay of the launch in question, in order to preserve the preferred two-week gap of three-crew station operations between Soyuz landings and launches. This means a roughly 45 day slip for the Soyuz TMA-03M landing, from 16th May to 1st July, a roughly 5 day slip for the Soyuz TMA-04M landing, from 12th to 17th September, and no slip for the Soyuz TMA-05M landing, which will still occur as originally planned on 12th November. With the first crew rotation of 2012 now via the Soyuz TMA-22 undocking and landing on 30th April and the Soyuz TMA-04M launch on 15th May, the next three months on station will be devoted to a spacewalk, and visits from Russian, European, and commercial cargo ships, all of which must be co-ordinated with each other to ensure no conflicts in the complex schedule. The first item on the order of ISS flight events for the next few months is Russian Extra Vehicular Activity-30 (EVA-30) on 16th February. During this spacewalk, the first of 2012, Russian cosmonauts Oleg Kononenko and Anatoly Shkaplerov will spend roughly six hours outside the Russian Segment (RS) of the ISS, preparing for the arrival of the Multipurpose Laboratory Module (MLM) “Nauka” in 2013. 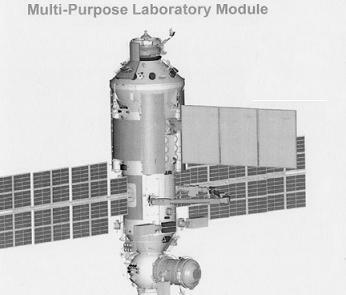 The MLM will dock to the Service Module (SM) “Zvezda” Nadir docking port, where Docking Compartment-1 (DC-1) “Pirs” currently resides. Due to this, DC-1 will need to be undocked and disposed of prior to MLM’s arrival, and so the two manually-operated Strela cranes currently attached to DC-1 must be relocated to elsewhere on the station in order to preserve them for future use. Thus, during EVA-30, the Strela-1 crane will be relocated to the Mini Research Module-2 (MRM-2) “Poisk”, a task originally planned for last August’s Russian EVA-29. 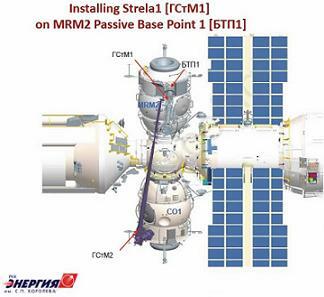 Strela-2 will move to the Functional Cargo Block (FGB) “Zarya” during a later EVA. Other tasks for EVA-30 including installing debris shields on the SM, setting up external experiments, and, as a get ahead, transferring an EVA ladder from DC-1 to MRM-2. 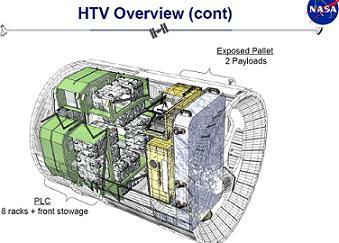 Following EVA-30, the next big task for the ISS will be to receive the European Automated Transfer Vehicle-3 (ATV-3) cargo carrier. Currently planned for launch atop an Ariane V from Kourou Space Center in French Guiana on 9th March, ATV-3 will dock to the ISS following a 10 day free flight, on 19th March. 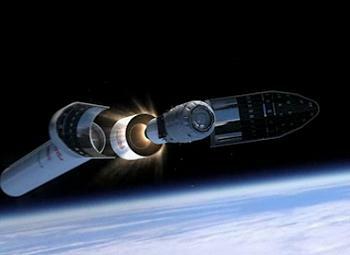 ATV-3 is somewhat controlling the debut launch of the new European Vega rocket, currently planned for 13th February, by limiting the number of days that the Vega launch can scrub before it must be stood down until after ATV-3, due to the need to have enough time to reconfigure Kourou launch site assets to support the ATV-3 launch. ATV-3 cannot move to make way for Vega, as that would cause problems for the already jam-packed and highly complex ISS flight manifest. ATV-3, which has been upgraded to carry more internal cargo than pervious ATVs, will be the first vehicle to dock at the SM Aft port since the Progress M-11M/43P spacecraft prior to STS-135 last June, since the failed Progress M-12M/44P was supposed to dock there following Progress M-11M’s departure in August. 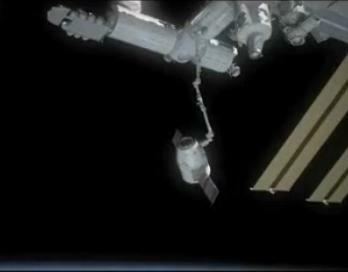 ATV-3 will remain at the ISS through to August 2012, during which time it will provide propulsive support for ISS attitude control, reboosts, and Debris Avoidance Maneuvers (DAMs). Following the ATV-3 docking, and with the Progress M-15M/47P launch now accelerated from 25th April to 20th April, a full month of time will be free in the ISS schedule for what will likely be the most watched mission of the year – the inaugural visit of SpaceX’s Dragon capsule to the station. SpaceX’s Dragon capsule had at the start of the year been planned for launch on 7th February, on the now approved combined COTS-2/COTS-3 (C2/C3) demo mission. However, ongoing delays, related mainly to software testing, integrated simulations, refinement of flight procedures, and closeout of various “open items” on the spacecraft and launch vehicle, have pushed the launch to the right. 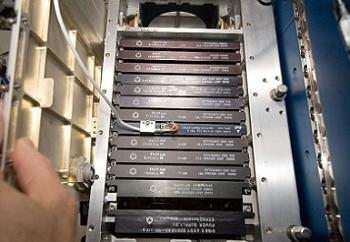 The ISS is now fully ready to support Dragon, however, with the Enhanced Processor & Integrated Communications (EPIC) card installations and both the X2_R10 and X2_R11 software transitions now completed, the latter of which includes Mobile Servicing System (MSS) 7.1 software, which updates the MSS, of which the SSRMS is a part, to support Dragon robotics activities. Officially, the target launch date for Dragon at this time is 20th March – the day after the planned ATV-3 docking, so as to avoid any conflicts with that vehicle. However, this date is merely a placeholder with the Cape Canaveral Air Force Station (CCAFS) Eastern Range, and at last week’s ISS status press briefing, NASA ISS Program Manager Mike Suffredini said that due to the volume of work still to be completed, an April launch date is more likely for SpaceX. SpaceX has until late April to play with, since the Progress M-15M launch and docking is planned for 20th and 22nd April, respectively, and after that, the Soyuz TMA-22 undocking and landing on 30th April. Following the TMA-22 undocking, ISS will be at three crew operations, which may preclude the Dragon berthing at the ISS due to the need to have two trained crewmembers aboard the station to perform the Dragon capture with the Space Station Remote Manipulator System (SSRMS). It is not understood at this point whether ESA astronaut André Kuipers would be able to fulfil the role of a trained crewmember, along with NASA astronaut Don Pettit, but if not, the next time two trained US crewmembers would be aboard the station is 17th May, following the 15th May launch of Soyuz TMA-04M, carrying NASA astronaut Joe Acaba. Following arrival of Soyuz TMA-04M, the ISS schedule is free through the rest of May and all of June, whereupon another Soyuz rotation will occur in early through mid-July, followed by Russian and Japanese resupply flights. Another vehicle to feel the fallout of the recent Soyuz problems is Japan’s H-II Transfer Vehicle-3 (HTV-3), which was previously scheduled to launch on 26th June, for a rendezvous with and berthing to the ISS on 1st July. Since the Soyuz reshuffle placed the HTV-3 rendezvous and berthing on the same date as the Soyuz TMA-03M undocking, following which ISS will be at three-crew operations, that meant HTV-3’s arrival would cause conflict issues, and violate the flight rule to have two fully trained US crewmembers available to support capture operations, since only one US astronaut would be aboard the ISS following the Soyuz TMA-03M undocking (Joe Acaba). Thus, HTV-3 now has to wait for Soyuz TMA-05M, carrying NASA astronaut Sunita Williams, to dock with the ISS on 17th July, prior to launching on what is now scheduled to be a late July or early August date. The months of August and September will then be a very busy time on ISS, with the scheduled undocking of ATV-3 on 27th August, and the unberthing of HTV sometime in late August or early September. During this time, Orbital’s Cygnus vehicle could also visit the ISS on its maiden flight, as much as ongong delays with launch site readiness mean that no firm date is set for that flight at this time. 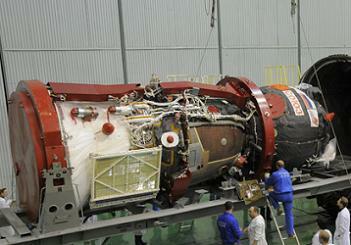 Also during August, Russian EVA-31 will be performed, along with the recently added US EVA-18. This EVA had been scheduled for summer 2012 before, but was pushed back to 2013. 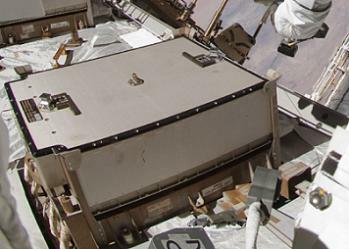 However, a recent external hardware failure, namely the Main Bus Switching Unit-1 (MBSU-1) located on the S0 Truss, caused NASA managers to reconsider. MBSU-1, which along with three other MBSUs distributes power around the station’s electrical system, started displaying erratic behaviour late last year, such as resets and loss of communication. MBSU-1 has now completely lost communications with the ISS, although it is still functioning and distributing power correctly. It is clear, however, that MBSU-1 is slowly degrading, and could be on the verge of total failure. 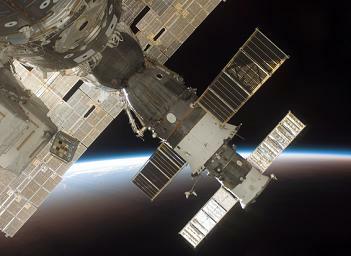 While source information shows that the ISS could tolerate a complete MBSU-1 failure via the crew installing internal jumpers to re-distribute power around the station, this would leave the ISS in what is a single fault tolerate situation, as a failure of another MBSU would require an emergency EVA to Remove & Replace (R&R) the failed MBSU. Source information shows that MBSU-2 has previously displayed errors similar to those seen on MBSU-1, such as bit errors, and thus MBSU-2 is vulnerable to the same type of failure as MBSU-1, which would not be recoverable via jumper installation. Due to this fact, NASA managers have decided to go ahead and R&R MBSU-1 this year, in order to reduce the risk of a complete failure leaving the ISS MBSUs single fault tolerant. This means that, although EVA-18 will include an R&R of failed hardware, it is classed as a planned EVA, not an unplanned EVA – the best example of which is August 2010’s three epic EVAs to R&R the failed Loop B Pump Module (PM). Procedures for a contingency EVA do already exist however, should MBSU-1 fail prior to its scheduled R&R and thus require an immediate R&R. EVA-18 will be significant since it will be the first US ISS spacewalk in the post-Shuttle era, an era which will see the ISS crew have to halt their research activities in order to deal with outside problems themselves, instead of leaving it to a visiting Shuttle crew as was done in the past. Thus, NASA’s strategy of pre-positioning ample spare Orbital Replacement Units (ORUs) outside the ISS prior to the Shuttle’s retirement is already proving to be a good strategy, as source information shows that two spare MBSUs are currently available outside the ISS – both stored on External Stowage Platform-2 (ESP-2), with one having flown to the ISS on STS-116 in December 2006, and the other on STS-120 in October/November 2007. 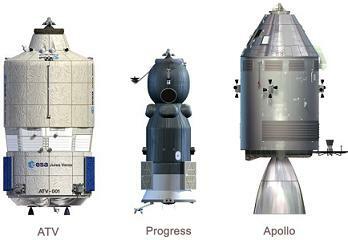 Two spare MBSUs are also available on the ground, one of which is planned for launch on HTV-4 in July 2013, and the other planned for launch in 2017. Both of these MBSUs are not susceptible to the bit errors noticed on MBSUs 1 and 2. 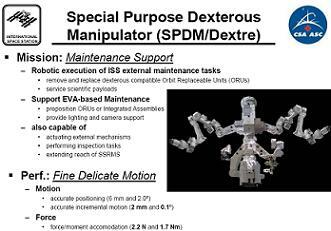 NASA is currently in the process of reviewing specific EVA timelines, and source information shows that two main paths are being considered – one involving the R&R of MBSU-1 using just the two spacewalkers, and the other involving the Special Purpose Dextrous Manipulator (SPDM) “Dextre” doing some of the preparation tasks prior to the EVA, including retrieving the space MBSU from ESP-2 and positioning it near the EVA worksite, to be installed by the EVA crew (it is not possible for the SPDM to perform the entire R&R). Without the use of the SPDM, a standard EVA timeline could accomplish the MBSU-1 R&R in 6 hours 30 minutes, around the standard time for an EVA. However, a streamlined timeline could accomplish the MBSU-1 R&R in only 4 hours 30 minutes, leaving around an additional 2 hours for some extra tasks outside the station. With prior assistance from the SPDM however, an additional 3 hours 30 minutes would be available for additional tasks. 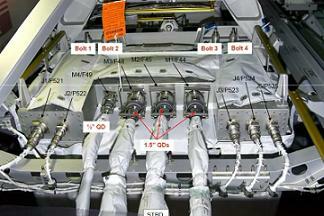 Source information shows that the additional tasks that could be performed include those deferred from the single STS-135 EVA in July 2011, such as the FGB Power & Date Grapple Fixture (PDGF) 1553 cable install, FGB PDGF grounding wire inspections, and SSRMS Camera Light Pan/tilt Assembly (CLPA) R&R. Some of these tasks could also be conducted during US EVAs 19 and 20 however, which have now been brought forward to February 2013, for reasons unknown at this time. Following US EVA-18, the remainder of 2012 will then see the usual traffic of Soyuz and Progress flights, along with possibly the first operational resupply flights of the Dragon and Cygnus vehicles under the Commercial Resupply Services (CRS) Program. Overall, despite claims that the ISS was going to be slowing down in the post-Shuttle era, the station is in fact as busy as ever, playing host to a wide array of international and commercial Visiting Vehicles (VVs), as well as the usual heavy schedule of maintenance and research activities. While delays in Russian and commercial vehicles continue to have an impact on the ISS, it is vital that both these systems demonstrate reliability this year, since both are now being heavily relied on to provide vital crew and cargo transportation to the ISS in the wake of the Shuttle’s retirement.